Not only do we take our�environmental committment�seriously, we take it to the next level. When an end user returns their cartridge to the OEM manufacturer, it is usually ground up or�shipped overseas�for incineration. Split cartridges can only be remanufactured once. Because of our proprietary�renewal processes, we can renew each cartridge up to four times! 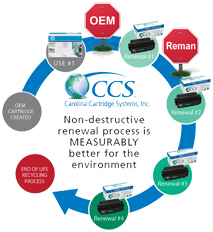 In this way, you are Saving Money,�Saving the Environment, and�Saving American Jobs with every CCS cartridge purchased! Click here for a PDF showing the difference between OEM, Common Remans, and our CCS Non-Split environmental benefits.